On December 4, 2000, Deng’s path finally led him to America and to central New York where his “singleness of purpose” has been improving his stake in life and helping others both in the Syracuse community and in his home country. After attending Onondaga Community College, Deng enrolled at the Columbia College-Hancock Field campus in Syracuse where he is currently working toward a degree in criminal justice with a minor in business administration. He expects to graduate in 2016. Though it’s not uncommon for college’s alumni to share stories as first-generation college students, Deng’s story definitely expands the scope of this achievement. 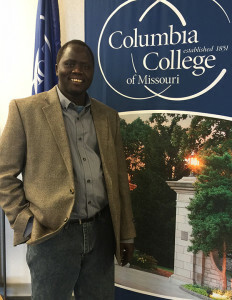 He is not only the first person from his family to go to college, but also the first person from his village in South Sudan to attend college. Deng’s goal is to one day provide a scholarship for children and women back in his village to attend college. He continues to make progress toward his degree while working at Syracuse University as a residential maintenance coordinator. On February 12, the Washington Post published the Top 5 snowiest cities in America so far this winter. It was no surprise that Syracuse, New York, came in at Number 5 with 74.7 inches of snow so far. More than 6,500 miles away, South Sudan is listed as one of the Top 10 driest places on Earth averaging just over 41 inches of precipitation in a year. To say acclimating to Syracuse, New York from South Sudan has been challenging would be a bit of an understatement. The climate (let alone the culture) is hugely different. For instance, just this year, Syracuse was named to the list of snowiest cities in America, while South Sudan was one of the Top 10 driest places on Earth. Despite it all, Deng has handled it well, much like everything else he has gone through in his life. That resiliency and desire to be a leader has served Deng well. After coming to America with no belongings, he has scraped and saved and now owns his own apartment. I met Abraham (Dut) in a Columbia College history class two years ago and joined his SSI board along with Dr. Vinciguerra. I wrote his biography back then and prepared our SSI website. I am a 72 year old college freshman, writer and historian. Dut first captured my interest and then my heart. He is my African son and I am his American papa. He has not known a father since he was 10 years old. He gives my life more purpose and inspiration. What a truly inspirational story! It is so uplifting to see how perseverance and hope can truly CHANGE LIVES and touch so many others as well! I am a 43 year old freshman and also believe that EDUCATION IS THE KEY! Much love to you Mr. Deng. Dut’s story is heart-warming for mall who go through adversities. It shows how resilient human beings are. Determination and hard-work are two ingredients, lust Columbia College. Keep up the good work, and congratulations. Dut’s story is heart-warming for all. It shows adversities can be overcome. The is a testament to the resilience of the human -spirit. Hello ne, it was my pleasure, to read all remarks and comments people. thank you to everyone, who had read my story and left some appreciations, it shows for me, your concerns as a great people for this wonderful country called united states of America. Your story paints to different pictures of humanity. There is the cruel side where we subject on another to hurtful things. Then there is the other side that shows that love and goodwill conquers evil. Bless you Sir and I pray that you will be able to accomplish mighty things here in this wonderful country and in Sudan the place of your roots. Having had the pleasure to instruct Dut in two classes, his experiences always adds depth to each class. His overall dedication to his studies is both encouraging and refreshing. 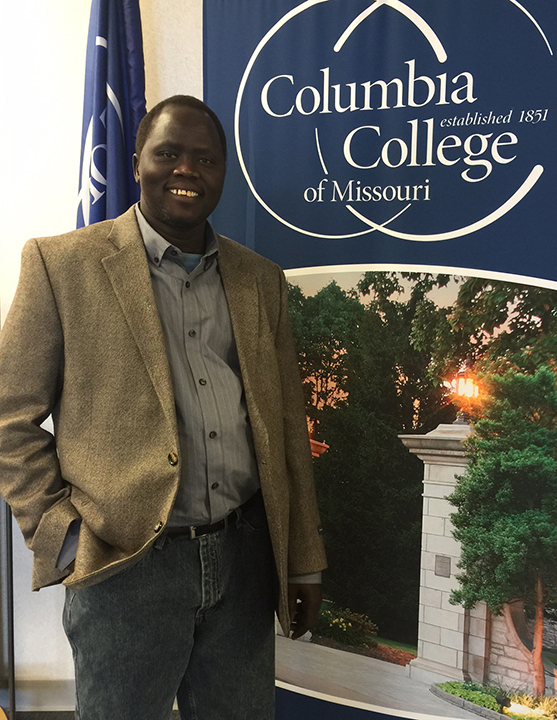 Although Dut comes to Syracuse via South Sudan, the concept of a small world is quite evident. We both know a Priest stationed as a missionary in South Sudan who has spent an incredible amount of time in Dut’s village. A remarkable connection via Columbia College. This story was not only inspiring to me, but challenging as well. I say that because his example confronted my views and made me reevaluate the items in my life I perceived as important and situations I have said were impossible. Dut’s example of perseverance, hope and humanity, despite his own tragedy, is one to be emulated. Dut – I pray for even greater success in your life and your purpose. It is an honor and pleasure to meet you through your story and you inspire me through everything that you have witnessed and experienced. I also am a survivor of breast cancer this year as well as a survivor of child abuse and I will graduate in 2016 with my Master’s in Criminal Justice towards Corrections. It would be an honor to meet you but I am in a small town in Texas that doesn’t even rate a post office. Through education and television shows me and my husband of 26 years whom served 25 years in the United States Marine Corps have learned much about you lost boys that are definitely not lost any more and I wish you all the good things in life America has to offer as well as all the love and respect that you deserve. I am so happy to see this story on the home page of Columbia College. This is an outstanding student who fully participates in class, writes great papers, studies hard, and does excellent work! He is a role model for other and I am proud to have had the opportunity to teach him in three classes! I’ve had one class with Dut. my research class. Unfortunately, the class was consuming, so not a lot of interaction; however, I know that he was very much the student, always asking for insight, and elaborating on concepts that were a little out there for some of us. I knew nothing of his story – only that he was a fellow student seeking a degree. I am now looking up the movie, and will be checking out his website. I have told my hubby about this, and several people at work. I’ve always been proud to work for Columbia College and stories such as this deepen that pride. Our ability to offer quality academic opportunities to both traditional and non-traditional students makes this a truly special place. Mr. Deng’s story is inspiring beyond words and I wish him great success in all his future endeavors (though I seriously doubt he needs encouragement from anyone!). Mr. Deng, I am honored to be a co-ed of someone so great. As a first generation college student myself, I truly understand the importance of education and determination. Never give up hope, never stop climbing to the top! I would like to say thank you so to everyone, who had read my story and react to it.